Finally, that took freaking forever. I ordered a LR Baggs M80 via eBay from the US, which first got stuck in customs and cost me 84€, then it turned out that it wasn’t a LR Baggs M80, it was LR Baggs M1A in the box. I guess it could be worse, at least it was the active M1 and not the normal. Since it would cost too much to return it and I wouldn’t get the custom fees back I decided to keep it, I paid for it and they sent me the correct pickup instead, which also got stuck in customs but this time it only cost me 23€. So it took more than a month for my LR Baggs M80 to arrive, I got a LR Baggs M1A that I don’t need and I had to pay twice as much as I was hoping for. Anyway, the LR Baggs M80 sounds pretty damn good, fuller and warmer than the LR Baggs M1A, with a lot nicer highs. Perhaps it wasn’t such a big difference that it was worth all the money and drama that it cost to get it to Spain but now when it’s here I really like it. I found a Hagström HIII back in April that I felt really sorry for and had to rescue, or rather save it from being slaughtered and sold for parts by someone else. Unfortunately it wasn’t a bargain and I probably wouldn’t have bought it if I wasn’t drunk at time, I need to stop browsing eBay on Sunday evenings. It had all the parts but the fretboard and frets were in a terrible state and the electronics weren’t working properly, basically a nice guitar and worth the price if it was working. 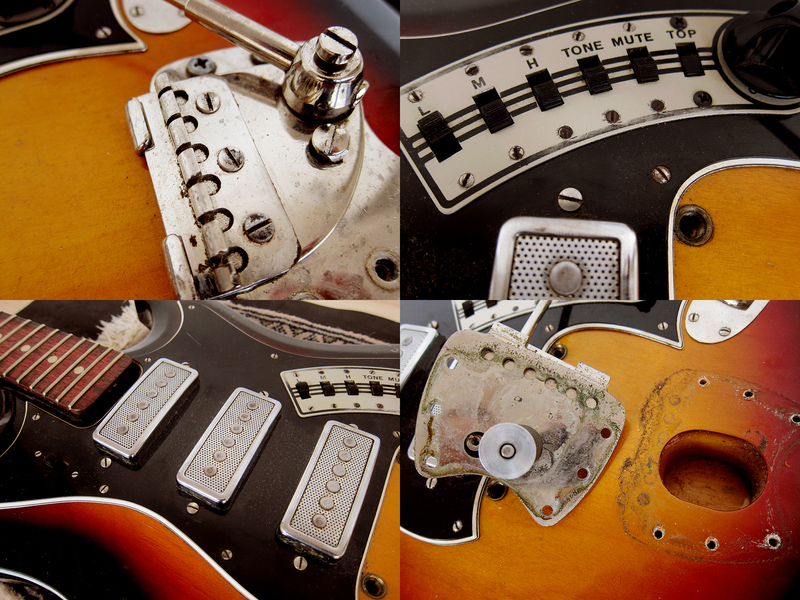 All the hardware cleaned up nicely, I love the Van Gent machine heads, a complete set tend to go for 100€ on their own, and it had the original tremolo, pickups and pickguard. 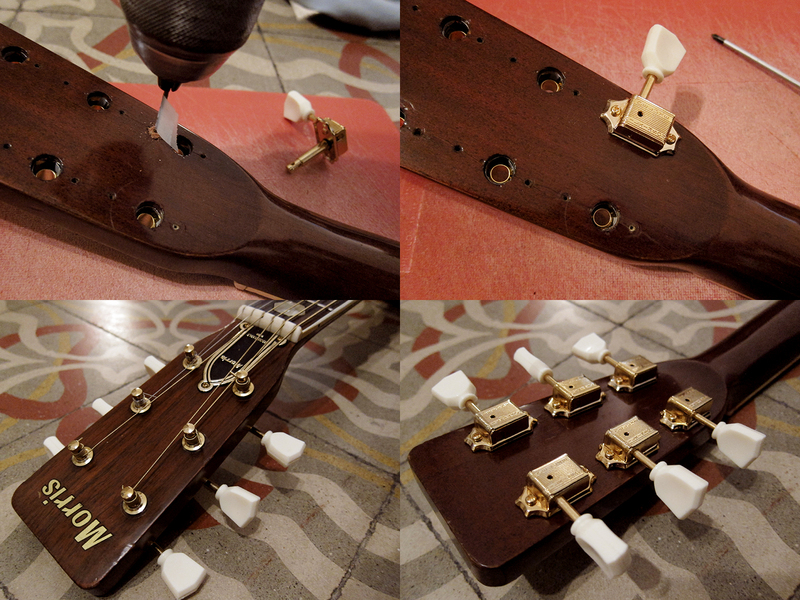 I had to remove the old frets, even out the fretboard and then refret it to get it playable. After waiting for over a month I finally got the switch needed from Hong Kong here we are, a fully restored and working 1970 Hagström HIII. Even though I love the look and sound of this guitar I can’t seem to get used to the fast Hagström neck, the fastest neck in the world, and therefore it’s for sale. 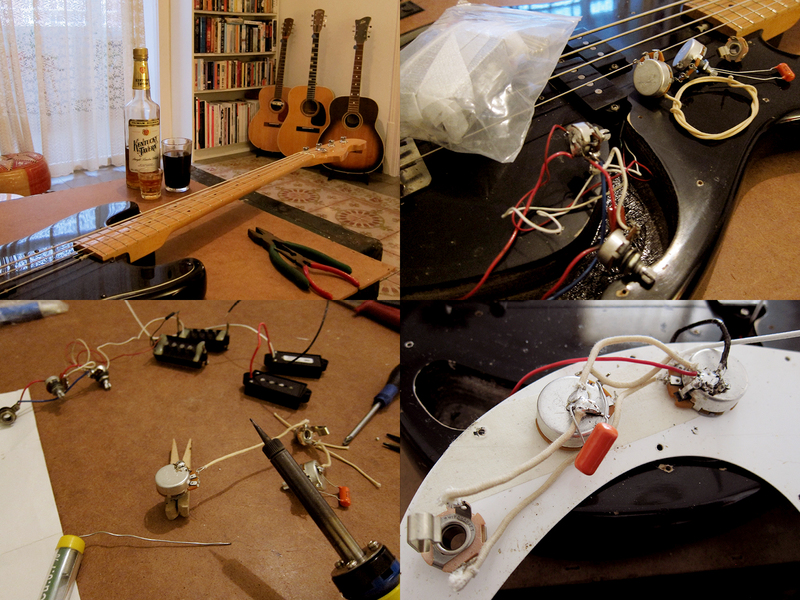 I started with taking the guitar apart and cleaning everything with a toothbrush and some soap and then polish up all the hardware. The electronics was in fairly good state but needed to be grounded properly. Also the on/off wasn’t plugged in and the bridge pickup’s switch wasn’t working properly so I had to wait a month for a new one from Hong Kong. Now everything is soldered up properly and is working fine. The back of the neck was a mess, dents and groves everywhere so I filled them with Nitro and sanded everything smooth before I buffed it up with metal polish so now you can’t feel it. 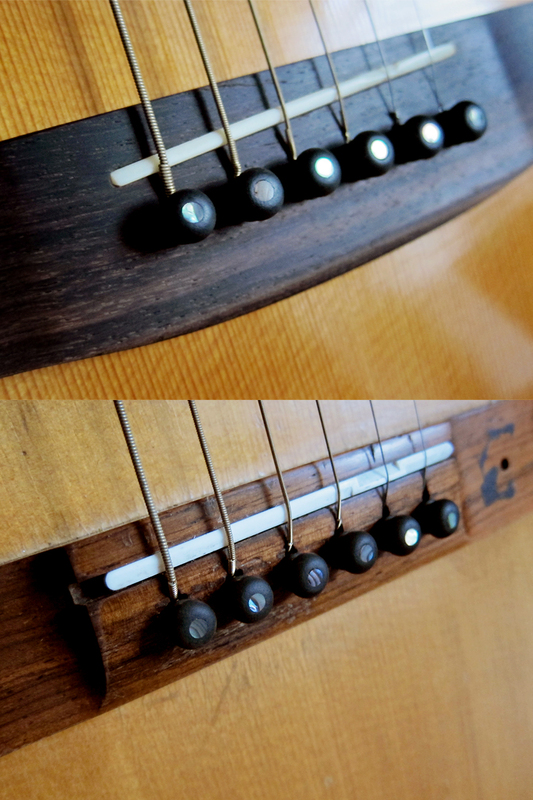 The main problem with the fretboard was the deep groves in it, it almost looked like the first 5-7 frets had been scalloped. 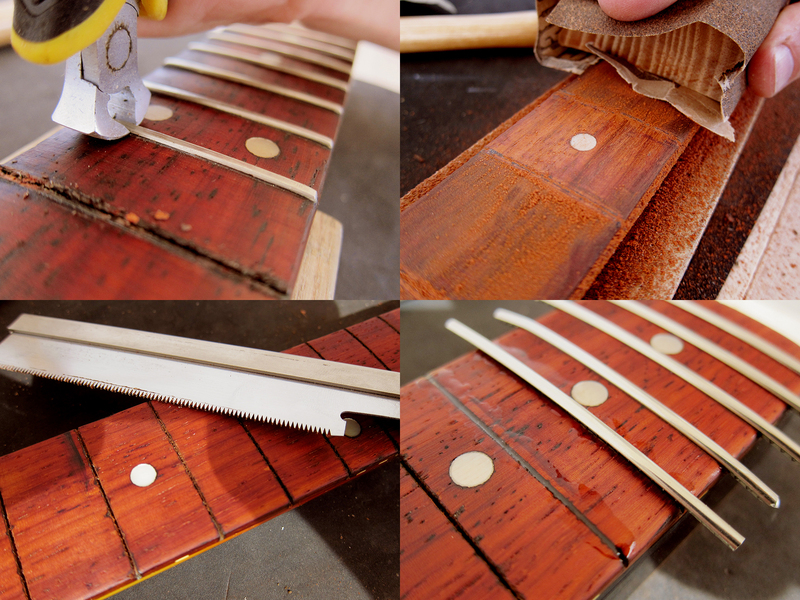 The original frets were really uneven too so I decided to refret it completely. I pulled out the old frets, sanded the fretboard even and then gave it 10″ radius before I re-cut the fret slots and installed new Jescar jumbos. 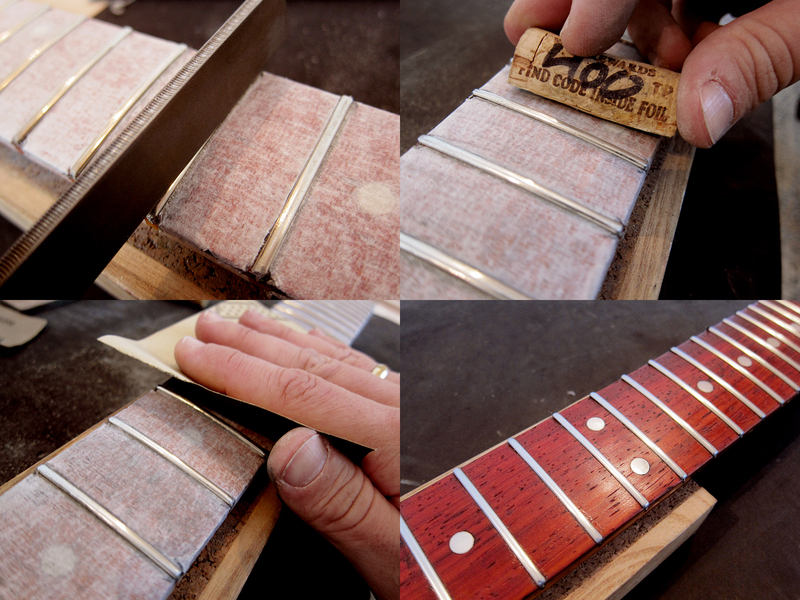 I levelled, crowned and polished the frets and in the end the fretboard looked pretty damn good if I may say so myself. This video was shot before I changed the bridge pickup’s switch so it’s cutting out occasionally, that has been sorted now with a new switch. I posted these two videos so you can here the difference between Hagström’s fat single coils and their humbuckers. Sometimes you see people using other peoples images when they are selling guitars. I’ve seen a few times that guitars being sold on Guitarristas end up on Milanuncios or some similar site by someone else. In this case I’m not sure if it’s a full blown scam or if the German eBay seller ums2002hund just preferred my guitar to his own. Here you can see my Playsound by Teisco Telecaster copy being sold on eBay, with both my image and my text, directly translated to German from my For sale page. Well it’s technically not my guitar any more since I sold it to my boss about a year ago, he has it here in the office so I’m pretty sure it’s not in Wiesbaden, Deutschland at the moment. Not the worlds greatest Telecaster copy but still a really cool and interesting guitar. 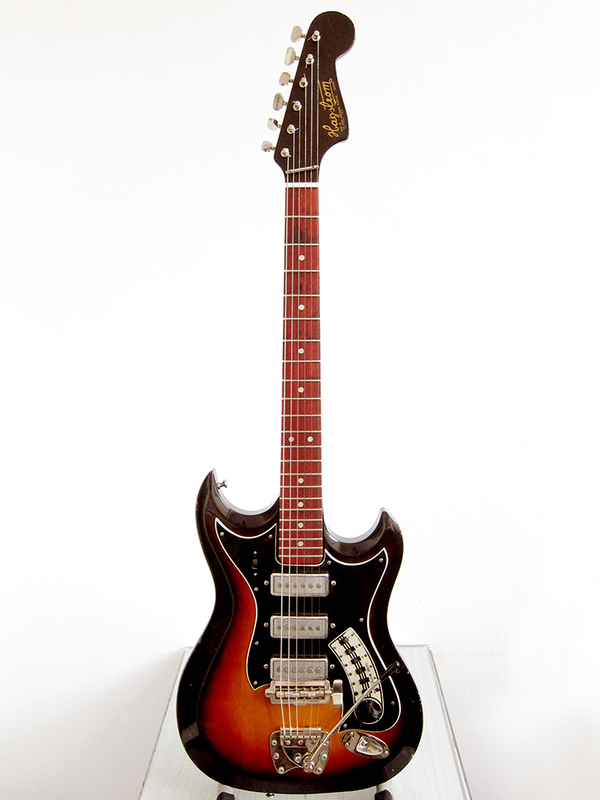 Made by Teisco in Japan around 1965 for the Western markets. These were sold in Woolworths in the UK under names like Arbiter, Sonatone, Audition, Playsound, Kay and Top Twenty. 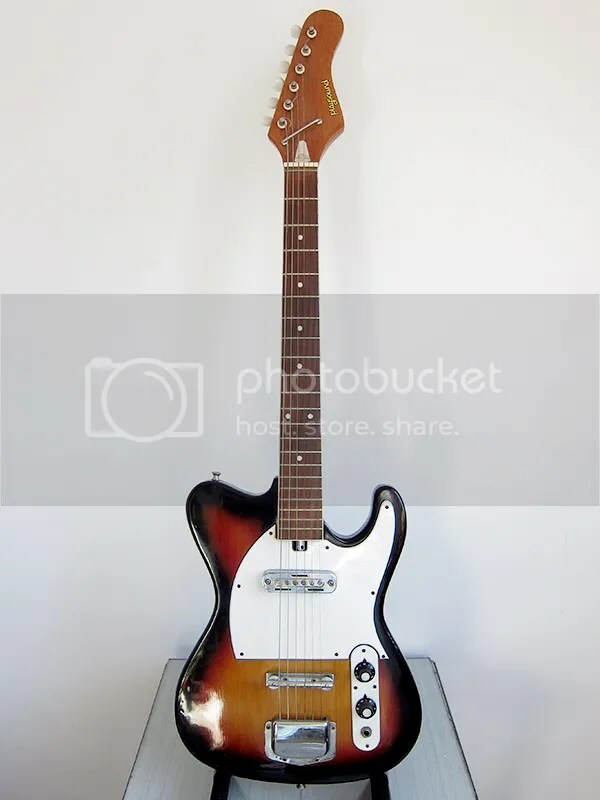 In the US they were sold in Wallmart under names like Silvertone, Kent, Beltone, Duke, Encore, Heit Deluxe, Jedson, Kimberly, Kingston, Lyle, Norma, Tulio and World Teisco. It has one gold foil singlecoil pickup, these are worth more than the guitar itself and are favoured by guitarists like Ry Cooder for their special sound. It’s in really good state for the age and only has minor dings and scratches to the body. A cool guitar to add to your collection or to gig with, it might be the only Playsound guitar in Spain. Here you can read more about Japanese guitar brands. You might have noticed that eBay have started with something new, well fairly new, called Global Shipping Program. Basically you pay all the import taxes and charges straight away and therefore don’t have to go through the customs when the item arrives to your country. I have had some issues in the past when I have bought things from the US, like my Claescaster body and my Goya T-18. It took the Spanish customs a month the process the item and deliver it to me and they charged me 40% of the original price including shipping in import tax and other fees. 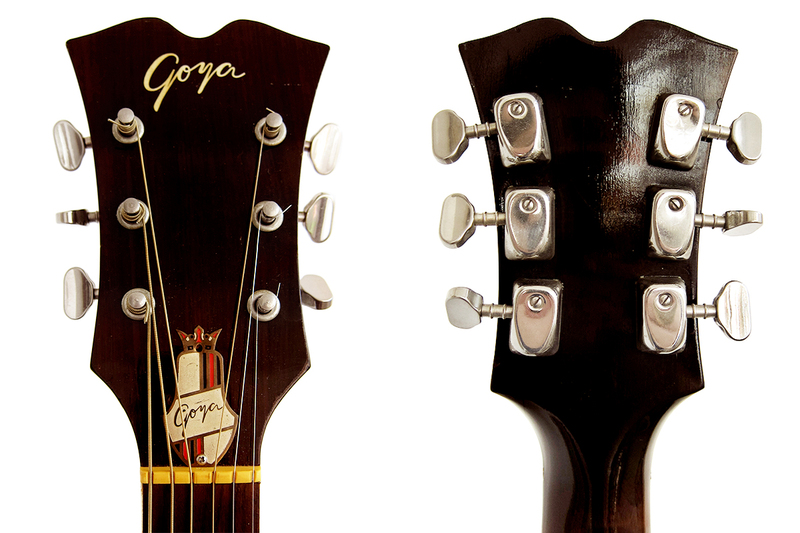 I recently purchased a lovely Goya 163 from Massachusetts using the Global Shipping Program and it took exactly 14 days to get it and I only had to pay 32.5 % tax on the actual price of the guitar, not final price plus shipping as they normally charge me when it goes through the Spanish customs in Madrid and best of all, no paperwork. So for anyone living in Spain I can highly recommend buying things from the States using the Global Shipping Program. I just installed a new set of Wilkinson WJ44 in gold on my Morris W-40. I wasn’t happy with the fake 10€ tulip Grovers I had before so I decided to get some Wilkinson Deluxe tuners instead. 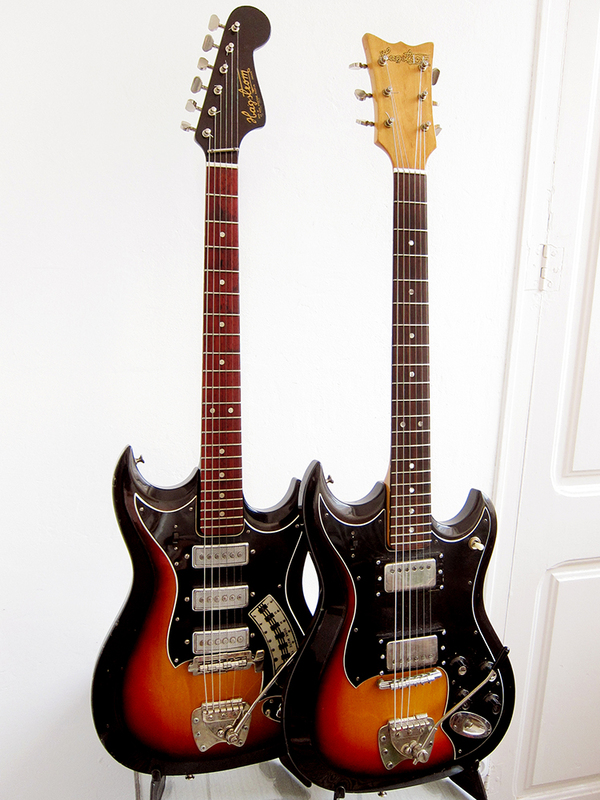 They cost me about 33€ including shipping from Vansonguitars on eBay. I really love the tulip shape and will always chose that if possible but I really don’t like the green buttons that most companies use, even the big ones like Schaller, Kluson and Grover. 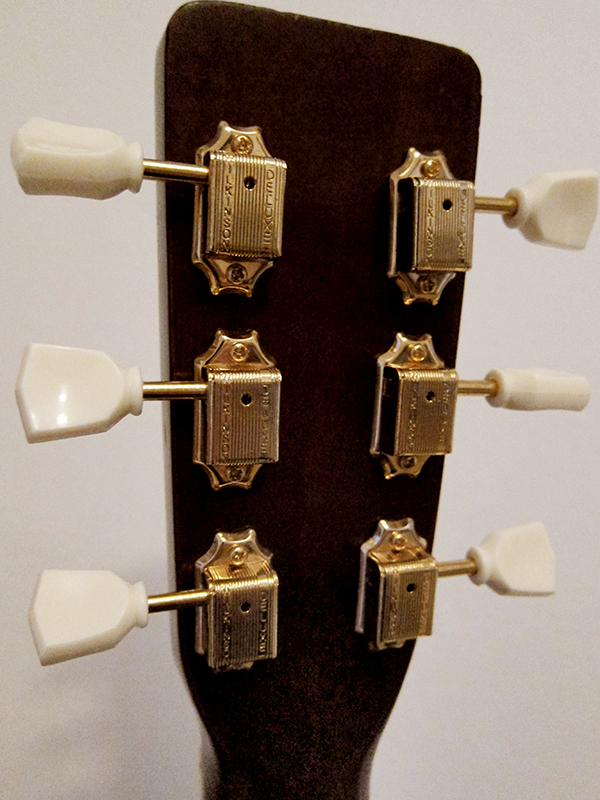 Luckily Wilkinson has started to make their deluxe tuners in both vintage green and cream white so I could get my beloved gold deluxe tuners in off white instead of hospital green. Another good thing with these Wilkinson’s is that they have a 9mm bushing instead of 8mm which makes them easier to fit if you have modern 10mm holes for the tuners. Wilkinson are manufactured in Korea by Jin Ho and I’m very impressed with their quality considering how the cheap they are. I have both Wilkinson tuners and bridge on my Claescasters, I love their vintage bridge with compensated brass saddles. Since the Morris W-40 has 10mm holes I had to try to make the 9mm bushings 1mm bigger. I decided to try the beer can trick which turned out to work pretty well. Cut a can open and remove the top on the bottom and then just cut strips as wide as the bushing. 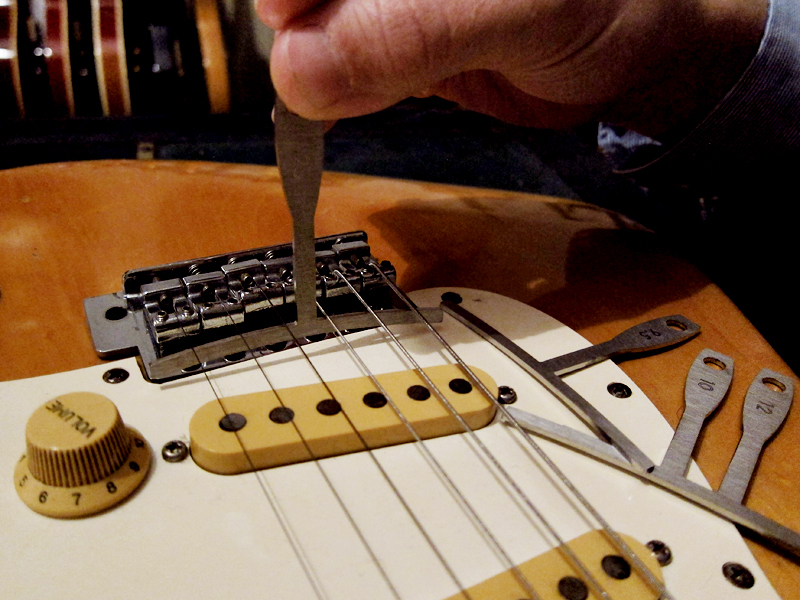 1mm might sound like nothing but the bushing needs to sit tight in the holes otherwise they will be pulled out or move from the string tension. I had to go for about 1.5 strip to fill the gap and there was a lot of fiddling and pain in my thumbs to get it in place but I eventually succeeded. 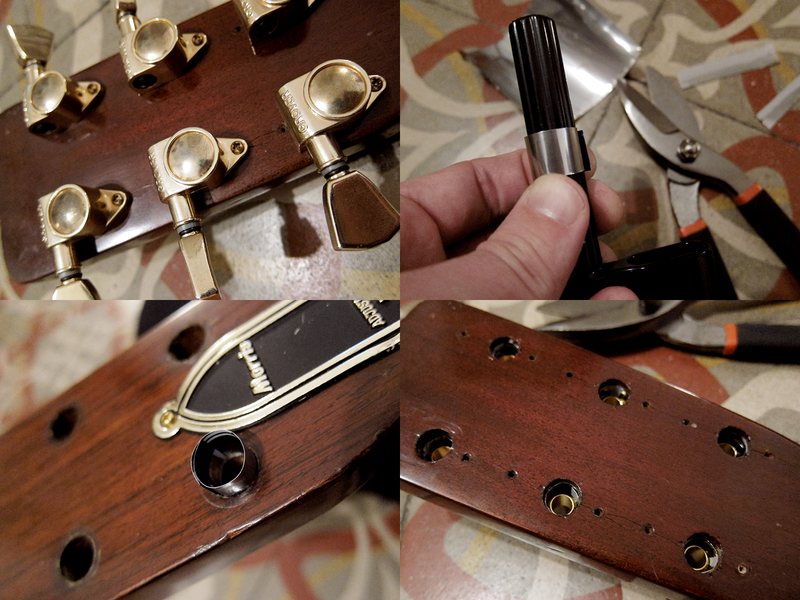 I was hoping that the screw spacing matched the old Morris tuners but they didn’t so I had to drill new holes. They are going to be hidden under the original tuners if I restore it but for now, I prefer gold and tulip buttons to the original Japanese 70’s chrome tuners. 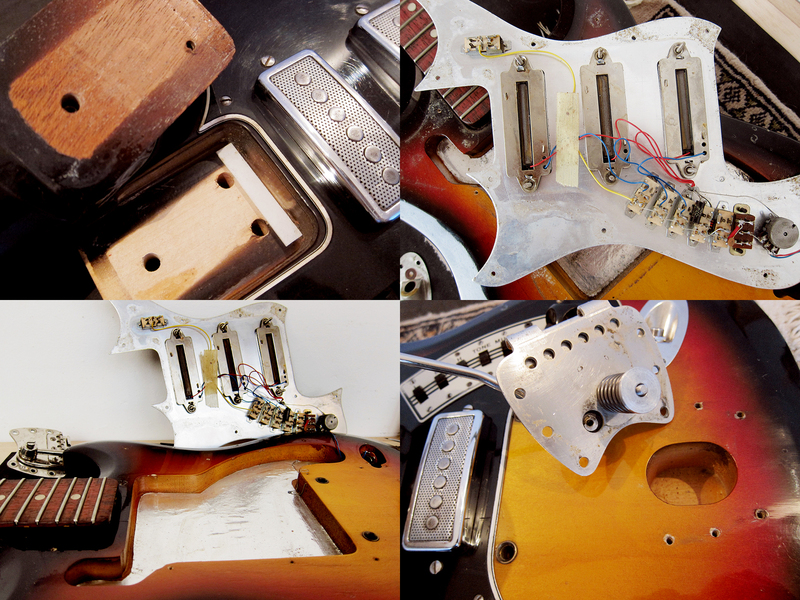 We had such a bad luck with the pickups we ordered for Verushka’s Hondo II P-bass. First we ordered a set of Artec P-bass pickups my favourite Hong Kong store EY Parts, but they never arrived, we waited for more than two month and finally got refunded instead. Then we decided to order from Custom World in Holland but that took ages too. Now we got everything we needed, full sized 250K Alpha pots, Orange drop cap, cloth covered wire, new jack and the Artec pickups. I put it together the other night and got it to work fine. I’m still really impressed with these Hondo II basses, the electronics and hardware are pretty cheap but that’s easy to change, and it’s so worth it for these amazing necks. It was pretty straight forward to change the electronics. I checked the Seymour Duncan’s wiring diagram for P-basses and followed that instead of the old wiring. My dad’s old Levin LT-16 has quite a few crack, well it had, because now most of them are fixed. I tried to figure out what type of glue would be best for repairing wood cracks and all the articles I read said the same thing, warm hide glue. The only problem is that I didn’t feel too intrigued by the idea of having to have melted horse hoves and other animals parts on the stove so I was desperately seeking for an alternative. Then my new found guitar building friend Roger in Sweden told me about fish glue. 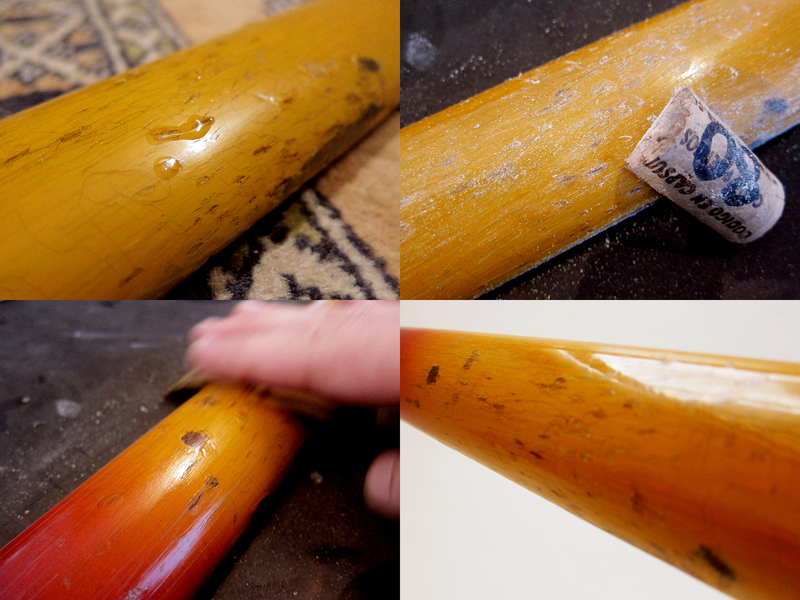 It has the same awesome properties as warm hide glue but can be used cold. It took some time to locate someone selling fish glue but eventually I found die-moebelwerkstatt, a German eBay seller specialised products for furniture restoration. I got myself some Canadian fish glue made from a recipe from 1870 and it’s amazing. I practised on my Francisca Montserrat and some other old guitars that had cracks in them before I dared to touch my Levin. It has gone pretty well so far, no major difficulties, but I wished that the glue pulled a bit more. I read that the special thing with warm hide glue, and apparently cold fish glue too, is that it is pulling the wood together when it dries, hence why it is so good for cracks and similar repairs. It might be my glue that is a bit old, or just the recipe from 1870 not being the best, but I wished it pulled a bit more. It still works really well, way better than I expected. 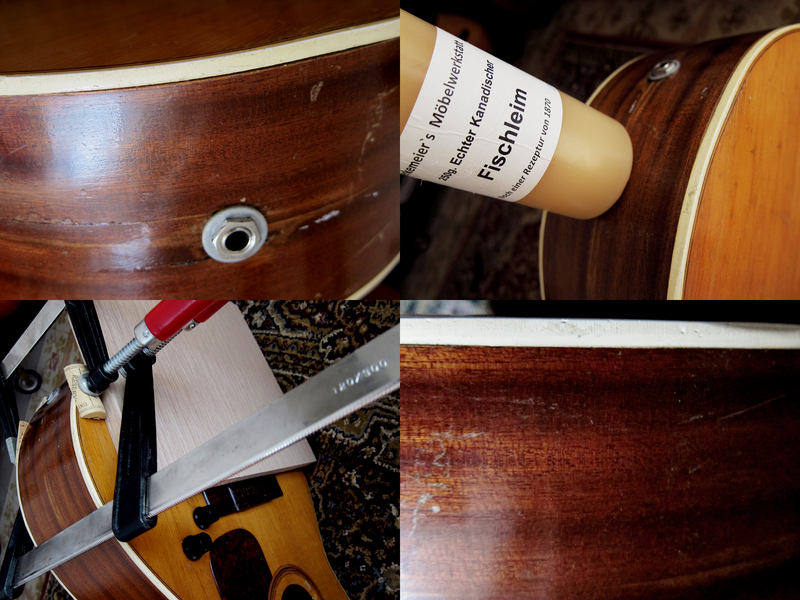 I feel a lot safer now, not only when it comes to buying old guitars that might have a crack or two, but to dare to use mine because if I happen to crack them I can always repair them with my fancy new fish glue. My new found love just arrived to the office, a 1973 Morris W-40. 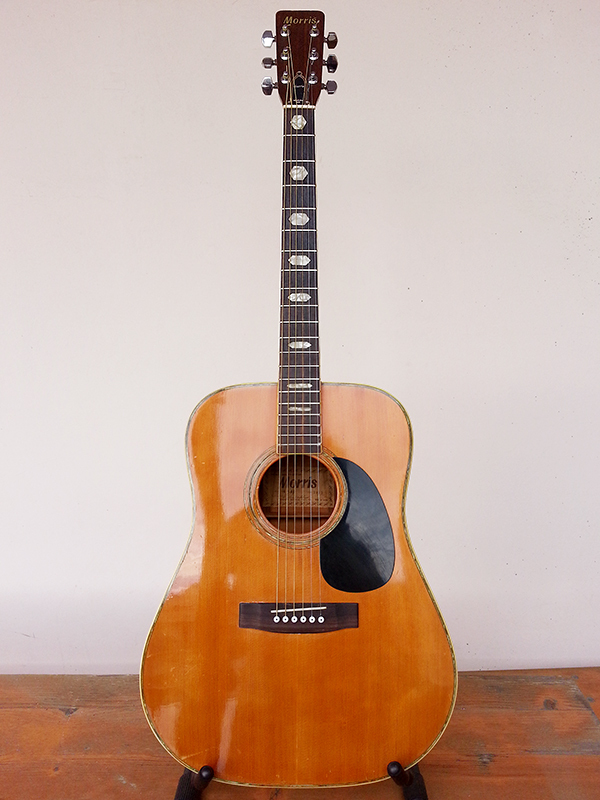 I have been looking for a Japan made Martin D-45 copy for a while and I’m really glad I went for a Morris. I have never played a guitar that sounds this good, amazing tone with really low action. She is a bit more worn than I expected, which doesn’t really bother me that much since the wood looks so good. I might put some gold tulip machine heads on her tonight, if my Gibson PMMH-025 fits. This Monday is just getting better and better. First I got to celebrate my girlfriends birthday, which meant getting up at 5.45 am and prepare breakfast in bed for her, and then I got this baby delivered and she arrived in one piece. Thank you Monday.